Comes with easel for display in your home. Artwork comes with little easel for display in your home. "THROWING CAUTION TO THE WIND IN A BLAZE OF COLOUR AND CHARACTER!" "LIFE AND ALL IT HAS TO OFFER!". Travelling the globe with a style that is highly individualistic, Kendall is taking the art world by storm. Leaving a technicoloured trail that leads all the way back to her home in Buderim on the beautiful Sunshine Coast. Painting professionally for the past 17 years, Kendall travels the world exhibiting and painting "live on location" for Tourism Australia, the Office of the Australian Consulate General and Department of Foreign Affairs and Austrade. Kendall has previously painted and exhibited in South Korea, Hong Kong, Singapore, Kuala Lumpur, Guangzhou, Toronto, Houston Texas, Christchurch, New Delhi, Mumbai, Bangalore and Shenzhen, China. Kendall entertains guests as she creates one of her masterpieces in a blaze of "colour and character" right before their eyes! But don't stand too close, things can get messy! 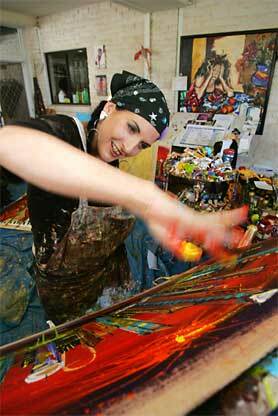 The sales of her artworks and extreme art performance style so popular, she is often booked 12 months in advance. In the coming year she will continue to showcase her work in her most popular Asian markets Singapore and Kuala Lumpur and has been approached to exhibit in Dubai, Shanghai, Beijing and Bucharest, with an action plan to take her new "Kendall by Design" homewares range to the four corners of the globe. From humble beginnings and after being told at school that "no one makes money out of art", Kendall is managing to create a niche in the art world nationally as well as internationally, selling hundreds of paintings a year. Kendall's paintings are housed in public and private collections world wide and Kendall intends to spread her wings even further in the international scene. "Who's Who of Queensland" book for her contribution to the arts in 2007; being the ONLY Australian artist to ever be invited to paint live at the World Cultural Fair in Shenzhen, China (this is an honour normally only bestowed on Chinese national painters), and gracing the cover of the 2009-2010 Sunshine Coast Yellow Pages for her contribution to the arts, culture and philanthropy. Kendall has always believed that if you can ever help another in need then "you should do so unconditionally", and as a result she has used her art over the years to generate hundreds of thousands of dollars in funds for numerous charities. "I think my works have a 'feel good factor' and people buy then because they make them feel happy and alive!! I absolutely love and am passionate about what I do; I'm always changing and evolving. I have always prided myself in being an innovator not an imitator; I create a quality product at a reasonable price that is always appreciating in value. I like to keep my work diverse so that there is always something for everyone". I NEVER set out to be Rembrandt and I never take myself too seriously!!"